The Shred Sled is a product the whole family very much enjoyed reviewing. What is it? The Shred Sled is the first 4-wheel inline, dual-deck board that makes it smoother and easier to get going. Instead of pushing off the board like a regular skateboard, riders use different parts of their bodies to propel the board, much like the movements used in surfing and snowboarding. The Shred Sled's flexible connector allows both decks to rotate around the vertical and horizontal axes so it's easy to maneuver the board. For better control, each deck has a grip surface to maximize traction and stability while the concave decks make for better foot control. The Shred Sled far surpasses the older 2 -wheel boards. It uses 4x80mm polyurethane wheels along with ABEC-5 bearings, which are smoother and stronger than standard hardware. These wheels rarely need to be replaced, unlike other boards. "The Shred Sled combines the experience of snowboarding, skateboarding and surfing into one new experience," said Eric King, president of The Shred Sled. So, what did we think? The Shred Sled was a hit with all of us! 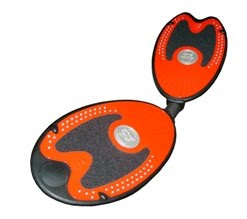 It's easy to use, so much easier than traditional 2-wheeled skateboards. It is easy to maneuver and stay on top of. We all really enjoyed that you can easily go from one direction to another. We give it two thumbs up! The Shred Sled would make a perfect holiday gift! Check out the Shred Sled in action!